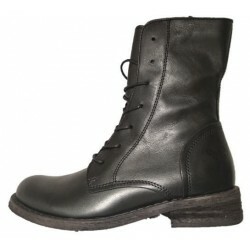 Black women shoes, combat boot style. Rain boots made with rubber and lined with winter fabric. The boots have a rubber sole and a low heel. The boots are laced. Available shiny black. Buy online, fast international shipping available. For any info: info@valentinacalzaturefirenze.com. by Airstep AS98, fall winter 2016-17 Unique sporty casual style low leather boots for ladies. Made with wonderfully painted leather. The leather is crafted with Tuscan tradition. Hand finished: every piece is one-of-a-kind. Casual but sofisticated style, as only Italian shoes can be.